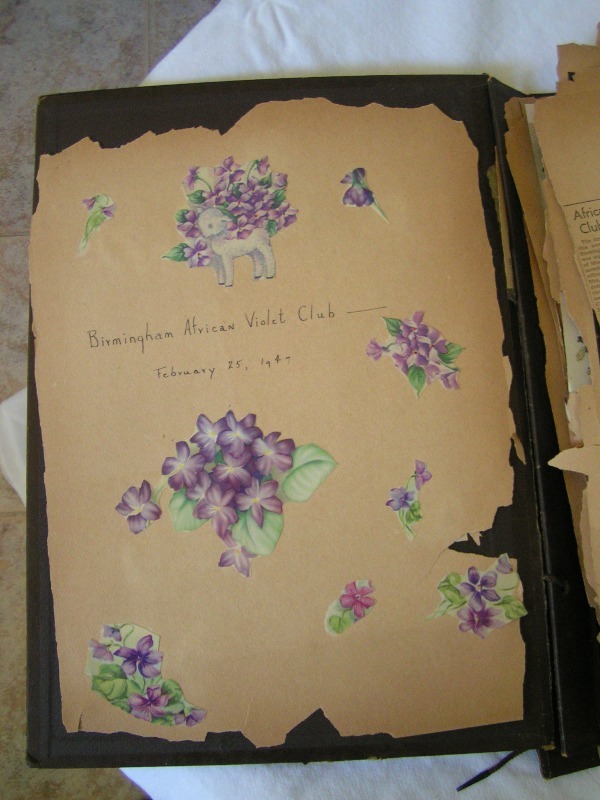 The story of the Birmingham African Violet Club of Birmingham, Alabama, began in 1946 and continued until 1969 when the pages of the scrapbook that had been lovingly kept by Mrs. J. B. Vance were closed. As far as we know, the story of this club’s memories remained closed until 2005 when Mrs. Vance, due to her advanced years, was forced to sell her home. In the process of packing her treasures, she found the old scrapbook. We can only imagine the beautiful memories she must have recalled. Perhaps she was able to take a nostalgic journey in her mind. Violet club activities of that era were approached with great pride and formality. In the 1940-1950’s, violet club meetings and shows were prestigious events. As you peruse the pages, notice the attire of the ladies with their lovely hats and sometimes gloved hands, as though they were attending a celebration of worship, or rejoicing at the marriage of a beloved relative or friend. Also notice the custom printed napkins that were used for their luncheons and teas. Yes, we can only imagine her beautiful memories and her love of violets. Mrs. Vance pondered what to do with this documented book of memories with valuable information about violets and pictures of accomplishments of her friends. She could not simply throw these memories out with the trash. No, for the love of violets, she sought out a new keeper of the book. She contacted Gwen Johnson, President of the Early Bird Violet Club of Birmingham, to see if she would be interested in the scrapbook. Mrs. Johnson accepted her gift on behalf of the club. During the following scheduled meeting, Gwen informed the membership, but for reasons unknown, the historical value escaped everyone. In 2007, interest was renewed when members took a second look at the old battered pages. Jerry Goodall and his wife, Anita, set out to “save” the crumbling scrapbook. Inquiries were made about the feasibility of a restoration project. Jerry Goodall solicited help from Martha Coleman, club secretary, and soon it became apparent that the project might well be cost prohibitive. After many phone conversations, Martha called Jane B. Sherer, a former Early Bird officer, and told her about the treasure the Club had been given. Jane, a Creative Memories Consultant with expertise in restoration and a love of violets, saw the potential and took on the project. Through her tireless effort and the generous financial support of Jerry and Anita Goodall, the Birmingham African Violet Club history is preserved.